The Little King Fabric Panel by Ami! Morehead for Elizabeth's Studio. 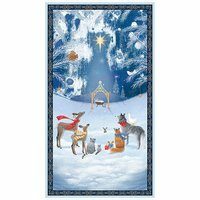 The Little King Fabric Panel features the nativity scene, the three wise men, the angel and the shepherds, and more. 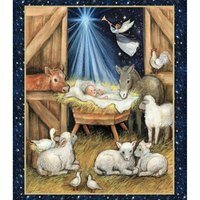 Reminiscent of Precious Moments dolls the Little King Fabric Panel can be used as a whole in quilts and wall hangings, or you could cut out the blocks and use them individually. The two blocks on the top and bottom measure 10-1/2" tall by 10-1/4" wide, and the large nativity block in the middle reaches 15-3/4" tall by 21-3/4" wide. 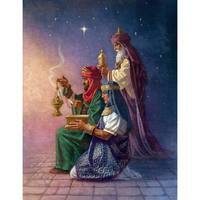 The Little King Fabric Panel is made of 100% cotton and measures 23-1/2" wide by 44" tall.